The program was a national model of educational success � 93 percent of its enrolled students graduating from high school and 85 percent going on to attend college, bucking a statewide trend that saw only 48 percent of Latino students graduating at all. The program taught Mexican and American history, as well as Central and South American literature and culture. Students and their teachers fight hard to preserve their program, marching to the statehouse, holding vigils, and testifying before lawmakers. They invite their legislators to visit their classrooms, and all but one refuse. When he does visit, he criticizes the poster of Che Guevara on the wall, and suggests that a poster of Benjamin Franklin would be more appropriate. At the center of the debate was Paulo Freire�s textbook, The Pedagogy of the Oppressed, which the school�s instructors used for the ethnic studies classes. The book is a famous example of critical race theory, which looks at and acknowledges the influence of institutional racism in America on non-dominant groups. The theory has been criticized as Marxist. 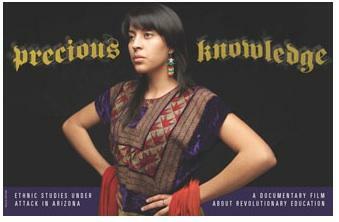 In 2011 Arizona lawmakers passed a bill giving unilateral power to the state superintendent of schools to abolish ethnic studies classes. The fight to restore ethnic studies continues in Arizona and in other states, as education continues to adapt to a changing population.